WOMAN: I was worried at first, but then he explained...you can’t get pregnant on April Fool’s Day! See the original 1952 art and dialogue for today’s Last Kiss webcomic here. SCENE: Woman on a sofa or couch surrounded by three smiling men. One of the men is handing her a box of candy. WOMAN: Gosh! I've never had this much fun with my clothes on! See the original 1959art and dialogue for today’s Last Kiss webcomic here. 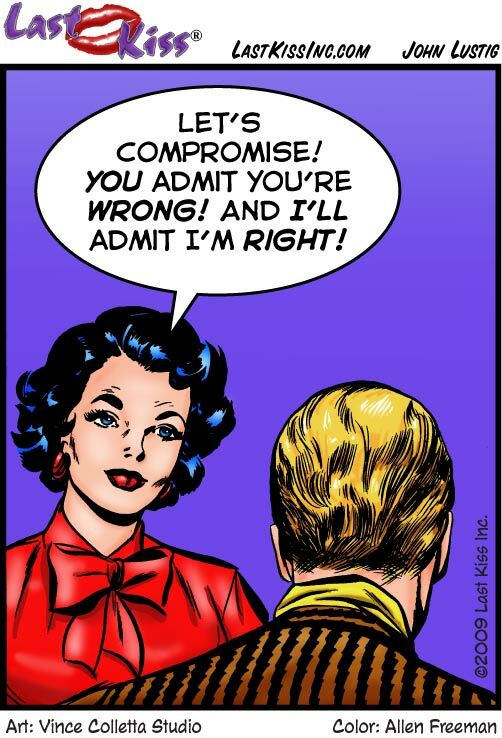 WOMAN (to Blond Man): Let’s compromise! you admit you’re wrong! And I’ll admit I’m right! See the original 1962 art and dialogue for today’s Last Kiss webcomic here. SCENE: A man is holding a woman's eyeglasses as he looks down at a woman. The woman (who isn't wearing glasses now) lookes back. 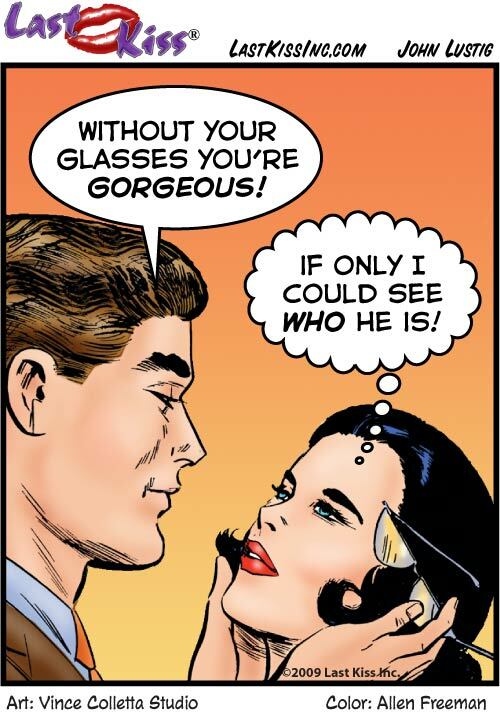 MAN: Without your glasses you're gorgeous! WOMAN (thinking): If only I could see who he is! Art by Vince Colletta Studio from the story “Teach Me, My Love” in FIRST KISS #29, 1962. See the original 1961 art and dialogue for today’s Last Kiss webcomic here. Narcissistic Lass! What are her powers? Who cares? She looks great…and that’s all that matters! SCENE: Man in suit talking to a woman. MAN: You’re So beautiful! You’re a goddess! WOMAN: I hate it when men lie! But You’re different! You tell the truth about how wonderful I am!